Any listing below which is still available from the publisher is linked to the publishers page. Some articles are also available online and are linked to. There are several magazines which have published transcriptions of Michaels music, but which I have declined to list here either because the transcriptions were lacking or because they are now offered through Stropes Editions, Ltd. If you have any additions to this bibliography, please e-mail Nomad Land's Webmaster. Pulse!, June 1999 "Rage in the Box: A new breed of guitarists is bringing a metal sensibility to folk picking"
An interesting article by John Diliberto, producer and host of Echoes, in which he traces the roots of the current wave of rock-tinged acoustic players back to one pioneering spirit. Music & Computers, May/June 1997. 8MHz is Enough. An extremely interesting interview in which Michael talks about his approach to recording. 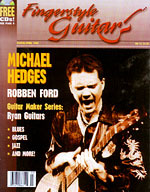 Fingerstyle Guitar, January/February 1997 (#19). Little Gremlins: Some additional thoughts on Ragamuffin by John Stropes. This article is available in Adobe Acrobat format from Stropes Editions, Ltd. Guitar, December 1996. A one-page profile on Michael, including a rather unusual photo of the man with his foot behind his neck while holding his black harp-guitar. Fingerstyle Guitar, November/December 1996 (#18). Submarine Harmonics: Some additional thoughts on Rickovers Dream by John Stropes. This article is available in Adobe Acrobat format from Stropes Editions, Ltd.
Fingerstyle Guitar, September/October 1996 (#17). A Fun New Way to Play the Guitar: Some additional thoughts on Hot Type by John Stropes. This article is available in Adobe Acrobat format from Stropes Editions, Ltd.
Fingerstyle Guitar, July/August 1996 (#16). Imagine This! Some additional thoughts on Aerial Boundaries by John Stropes. This article is available in Adobe Acrobat format from Stropes Editions, Ltd.
Musician, November 1995 (#204). Michael Hedges Goes with the Flow. Interview with transcription excerpt to Aerial Boundaries by John Stropes. Anthem Monthly, September 1995. Michael Hedges and Rhythmic Guitar. Interview. Acoustic Guitar, March/April 1991. Between Rock and a Soft Place. Interview with sidebar on EQing. Also includes an article by John Stropes on Michaels string-stopping technique called The String Stops Here. Home & Studio Recording, February 1991. The Savage Myth. Interview with sidebar on equipment. Guitar World, January 1991. Acoustic Thrash. Interview. Guitar Player, October 1990. Michael Hedges: Acoustic Overdrive. Interview as well as sidebar on stage and studio equipment. 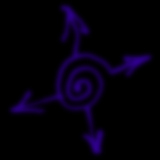 Transcription excerpts of The Naked Stalk and Nomad Land. Please note that The Naked Stalk is included in the book Michael Hedges/Rhythm, Sonority, Silence with notes by John Stropes. Guitar World, May 1988. Heavy Mental. Interview with sidebar on equipment. Interesting photo of Michael and Leo Kottke on tour together in 88. Frets, November 1986. Michael Hedges: Windham Hills Man in Motion. Interview, sidebar on equipment, and transcription of Layover. Please note that Layover is included in the book Michael Hedges/Rhythm, Sonority, Silence with notes by John Stropes. Guitar Player, February 1985. Michael was the featured artist in the article New Directions in Acoustic Steel-String.